When designing interior spaces, I typically choose paint color first. If you work in the field of design, you may have been taught to do the exact opposite. I know, I know. That’s what they teach in design school. You start with art or fabric or rug, then choose a wall color from one of those – you simply have to match it. Color me crazy, but what affects you most when you enter a space? It’s what you see the most of, right? 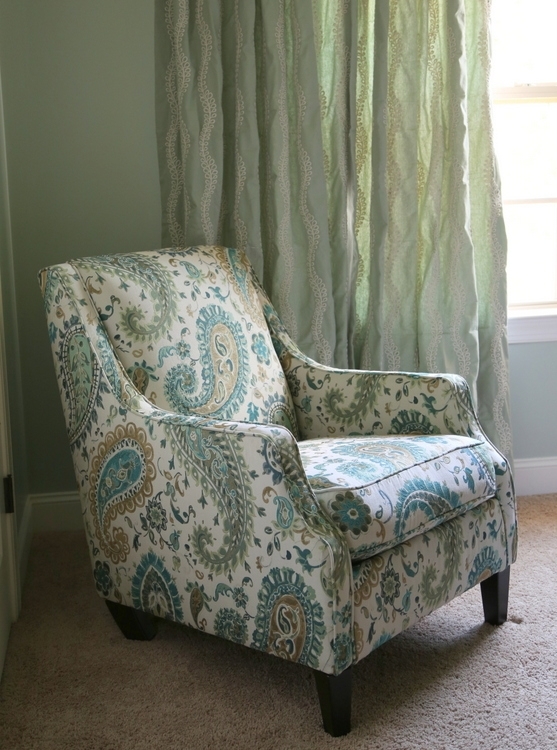 So if you choose the background color in that piece of chair fabric or a color in 15% of your area rug for your wall color, it may match but that doesn’t mean you (or your clients) are going to LOVE it. Last year I designed four children’s bedrooms in one client’s home. Although the youngest of the family was still in a crib, the idea was to create a room that would be colorful but sophisticated enough to take her from little girl to adult. Designing “evergreen” children’s rooms is something I really love to do. It’s an approach that enables you to stretch your dollars by making design decisions that last throughout childhood – so you don’t have to buy new every few years when your kids tire of Barbies or Pokemon or whatever “theme” of the season they are into. Of course, we should start with the “before.” There really wasn’t much to work with. Just a full-sized mattress and a crib. My client wanted happy color for her baby girl’s room, but something not too babyish or predictable. Yes. Yes, I do, when I have the opportunity to do so. 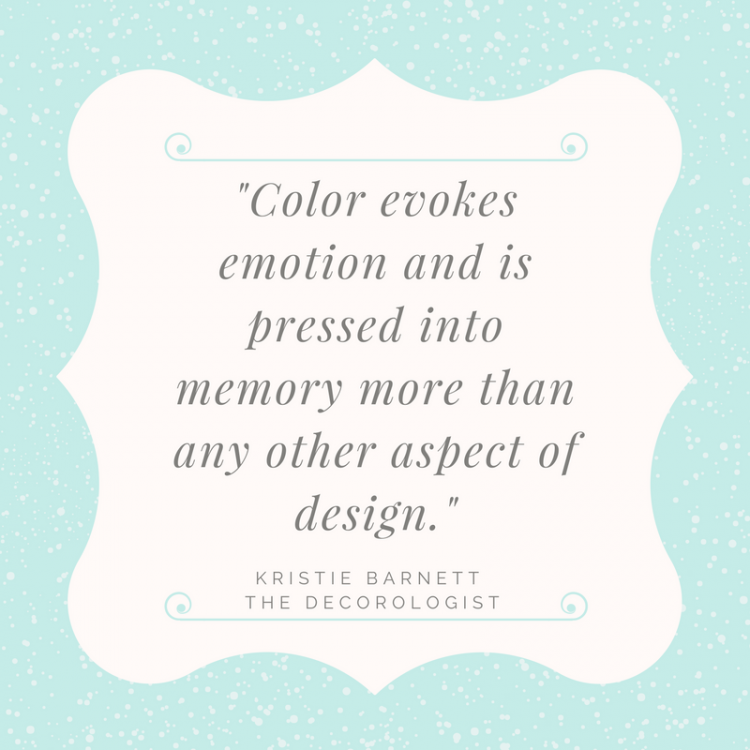 Paint color has more impact than any other design element because it’s always in your field of vision. If the paint color isn’t pleasing, the room design is a bust. And that’s why you should choose paint color first. It’s more important that you love the color that you see all around you on the walls than it is to first choose a fabric that you only see when you view the space from a certain angle. Of course, if you already have the *perfect* bedding or rug or whatever that you want to launch the design off of, you can start with that. 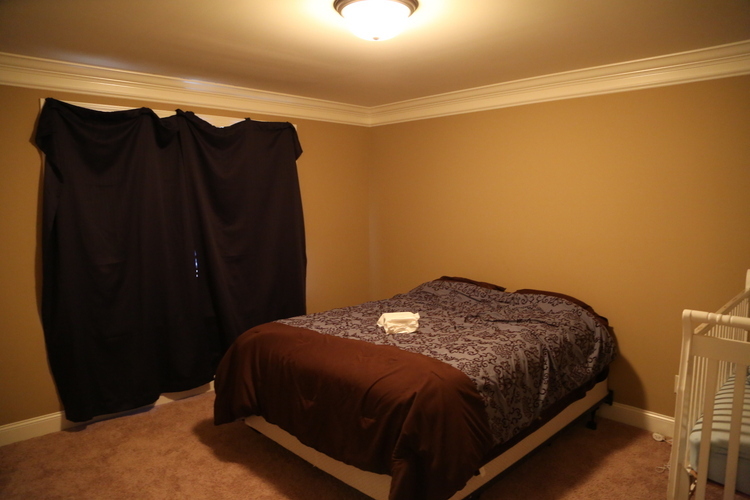 But keep in mind that the wall color will likely have more impact on how you feel about the room than anything in it. 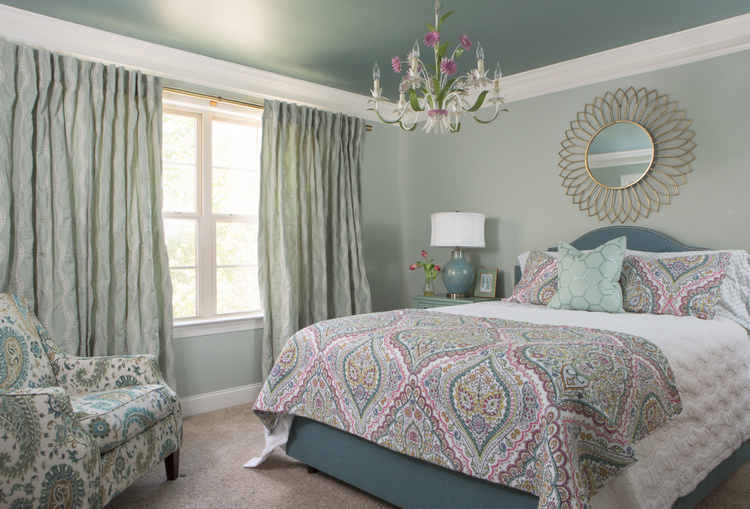 We started with the paint colors for this bedroom design. Benjamin Moore Prescott Green HC-140 for the walls and Waterbury Green HC-136 for the ceiling. Then I took my Small Wall color sample boards and went shopping for the room. 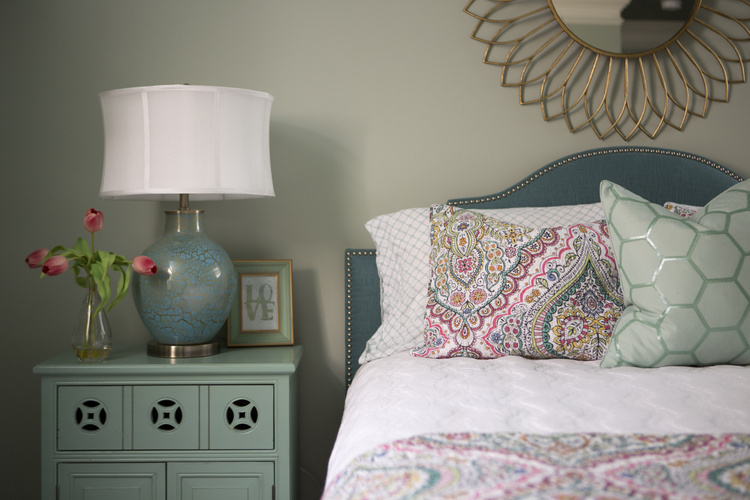 I chose fabric for the curtains and the perfect lamp for the bedside – could the colors of the lamp base be any better??? 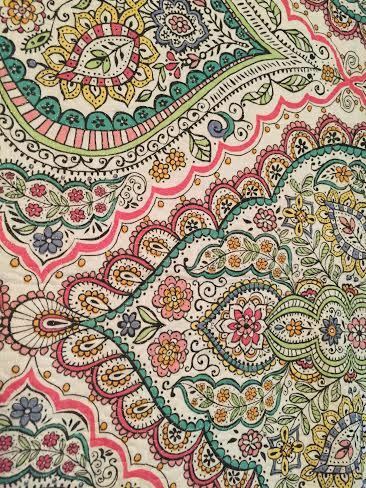 The bedding we chose works for a girl of any age and is such a great pattern. Every bedroom needs a comfy chair, and my client wanted a nice place to read stories to her young daughter. I knew that the lighting for this bedroom needed to be special, so we scoured Ebay for a vintage tole chandelier. This one was originally 1970s green and gold. I had my client paint the flowers and ribbon detail in a pink that pulled from the bedding fabric. I don’t know about you, but I think this is a beautiful bedroom for a girl of any age. In fact, I’d love a room like this for myself! I encourage you to choose paint color first. It may be easier to choose an “inspiration piece” like fabric or art first and pull a paint color out of it, but I’d rather my client be happy looking at all angles of their space (which they will be if they LOVE the paint color). I’m happy to hear your thoughts or rebuttals in the comments below! 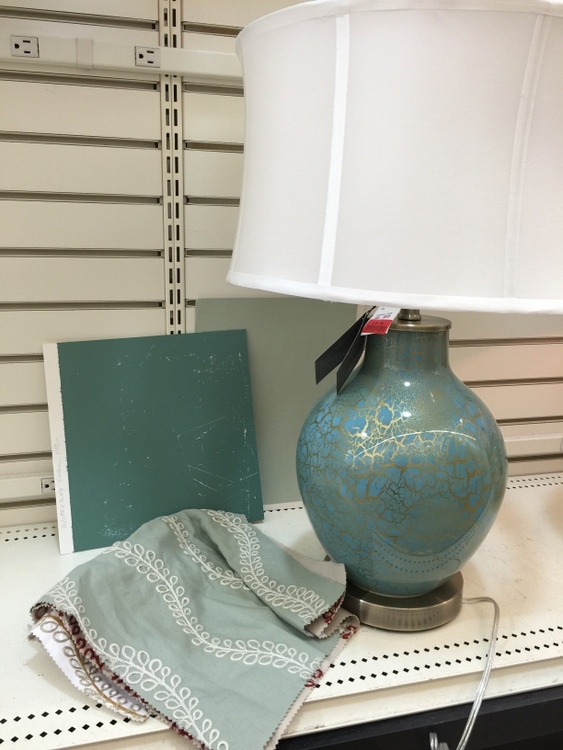 This entry was posted in Color Consultation and tagged bedroom, benjamin moore, color, design, HomeGoods, nashville, paint, prescott green, waterbury green. What a transformation! It would also make a beautiful guest room! The chair would update my living room nicely to bring a fresh look to my existing wheat toned sofa. Prescott Green has been on my list of colours to consider when I start my room redo. I have seen it used successfully by you in previous posts. I so enjoy your posts Kristie, thank you for sharing. Thank you so much for commenting, Trudy! I’ve had Prescott Green in my living room for 16 years now, and I still love it. It’s very similar to an old Martha Stewart color called Windowbox, which an artist friend had painted his whole interior in the 1990s. I copied it for my bedroom in my former home, and have been using it ever since in one way or another! The wall and ceiling colors are beautiful! I would have never thought to paint the ceiling darker, but with a sheen. Your right about the color of the walls, it’s a great idea. Thanks, Natalie! I suppose the difference is in what you decide to be your “inspiration” for a space. When starting from scratch, I tend to use a great paint color as my inspiration. I AGREE 1,000%. Thank you for explaining – and showing – so clearly! I have always chosen the wall color first as inspiration because I love playing with colors and feel the walls are the most impactful. I’m glad to hear your validation!! Yes! I like how you phrased it: “the walls are the most impactful.” So very true! I chose paint first for my living room and it’s the one room in my home that I love the most. I followed the rules in the other rooms and I am so disappointed with the result. Thank you for sharing this because now I know what I need to do moving forward. 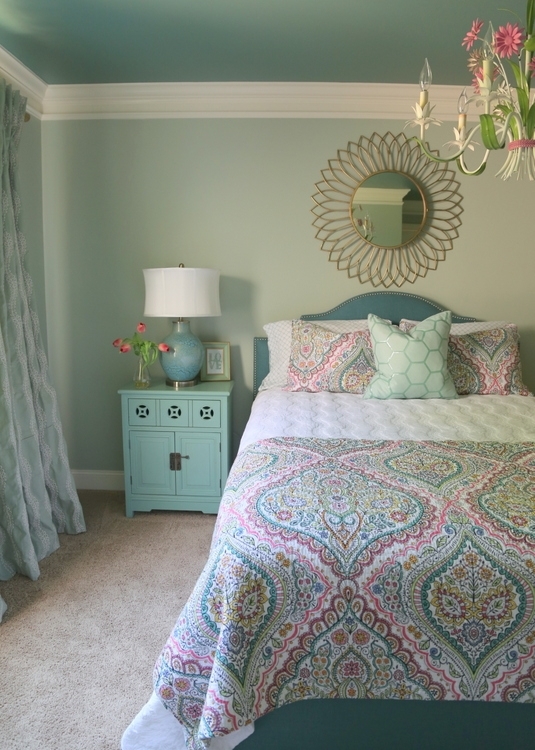 Beautiful design on the girl’s bedroom! I really thought I’d be getting more push-back about this approach, so it’s good to hear a homeowner express their personal experience with this. You “followed the rules” and probably had a great color match, but that doesn’t mean you’ll love the result! Thank you for sharing! I like this idea. No wonder I’m never “thrilled” with my paint. I should start there! I did LOVE my master bedroom in our former home and I think I did chose paint first when we lived there. It appears (online anyway) to be very similar to what you chose. It was an old color by Martha Stewart for Sherwin Williams called Milk Pail. I was happy every time I walked into that room. Need to revisit that one! There used to be a line of paint that Martha Stewart did for KMart that had some beautiful color options – too bad they have apparently disappeared. I think I remember Milk Pail! I am so glad to see you say this, Kristie! 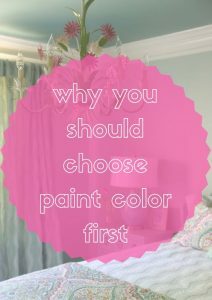 I had thought the same( especially for staging) about the paint color first, but kept reading opinions to the contrary. I guess this is also a life lesson in trusting your God given instincts! Your rooms are always so very soothing, Kristie! We all need THAT these days…. Beautiful work, lovely finds. Green is like an eternal color, always classic. Thanks for putting this out there today, Kristie! Hi, Paula! Thanks so much! You are correct that most have a differing opinion about room design. While I’m always mindful of existing elements in the room that need to be considered when choosing paint color, I’m always going to pick wall color before new furnishings and decor. 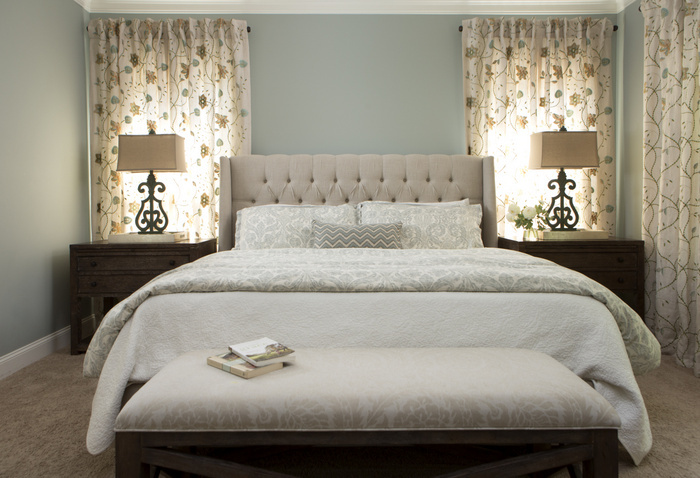 I let the paint color guide the color choices in my decor, not some bossy swatch of fabric. 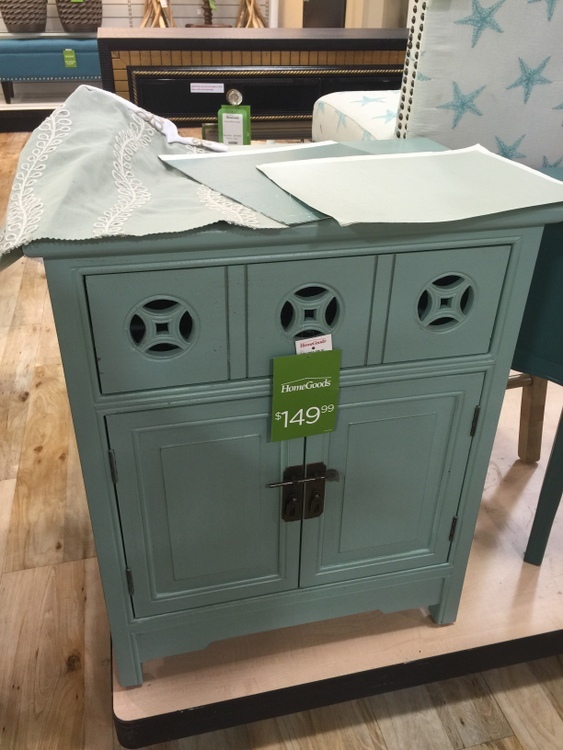 My favorite of your finds is the little side table! Color, drawer cut outs, everything! Gorgeous room. I would not have thought to paint it that color! Or the ceiling either! But it works so beautifully together. I live the hanging lamp! A perfect touch! Interesting perspective. Unfortunately none of your photos appear on my iPad since you upgraded your blog. Very frustrating, because I enjoy your work, and miss seeing it! I’m sorry to hear that – not sure of why you wouldn’t be seeing images. If you are able to see them on a laptop computer or your phone, the issue may be needing to update your iPad software? Let me know it you can or cannot see them elsewhere, and I’ll let my tech guys know!!! The problem seems to be on my end, since the images were present on my phone. 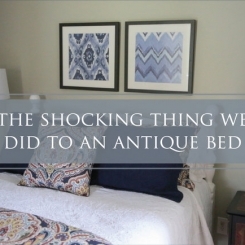 Thank goodness…what a gorgeous, well pulled together room! Simply loved everything about it!! Another job so well done! Have you tried viewing it on your phone or laptop computer? Check that first – if you can see the images there, you may have an issue with the ipad. Maybe you need to install updates? 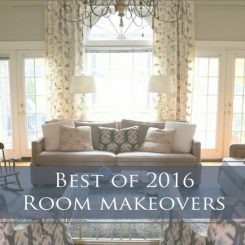 I chose paint colors first for most of the rooms in my home and the design came together beautifully from there! I was able to find the perfect fabrics and accessories to coordinate. 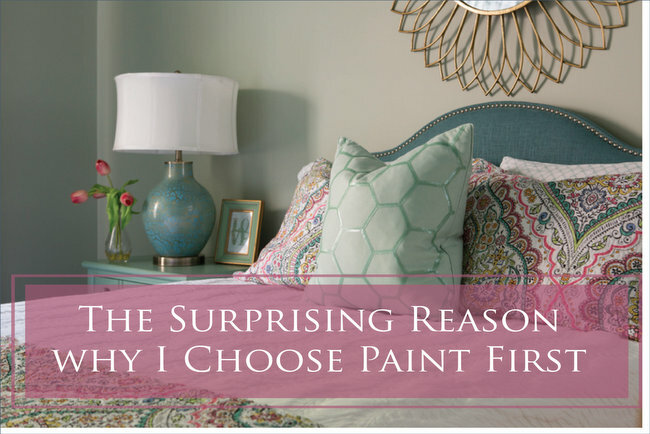 I don’t get why that is said to be such a ‘no-no.’ I love choosing paint colors and have always been happy with my selections. I’m pinning this gorgeous room for my future bedroom! Stunning. Yay!!! I’m glad it gives you some inspiration for you new bedroom, Beth! The room is just lovely! Love the wall color. Can you comment on whether you feel the same when the wall will be painted a neutral rather than a color? And how you narrow down from the many variations available once you chosen a direction? Thanks! Thank you. Your reply is always very thoughtful and helpful! What about a new house. I am going crazy trying to figure out cabinet colors and quartz. Plus the island color. It’s difficult to choose a paint color when the walls haven’t been dry walled yet?? For new builds, it depends on whether or not you have your heart set on something in particular. If it’s a certain quartz or cabinet colors, then your paint colors will be dependent on those choices and that’s your starting point. If you instead have some ideas for paint colors that give you the look you are going for, you can choose that first then make your hard surface choices based on that paint color/colors. What a lovely room! Fantastic! Mary, the bedding was from HomeGoods! I love to mix sets together to make it custom-looking. 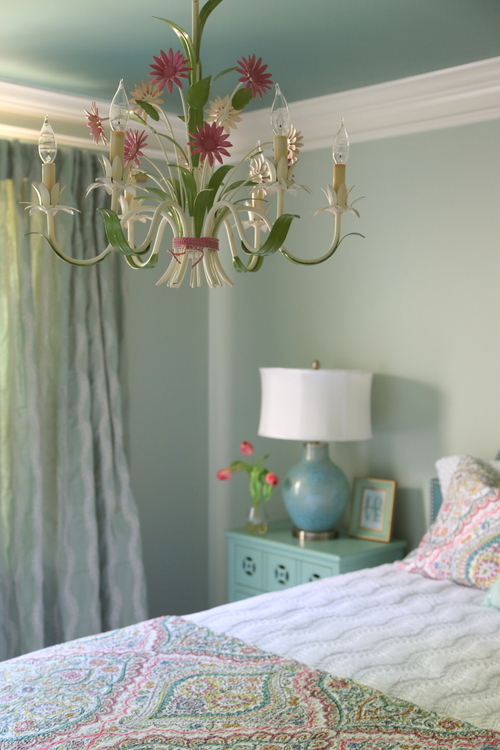 Gorgeous room, Kristie! I love the side table and the mirror. Perfect for any age! I liked the colors you used, simply beautiful. I liked your idea, now I am going to follow you. All the pictures are very pretty. What a fabulous, artful transformation. The chandelier is absolutely delightful and gives the room personality. Well done!!! so if i choose the paint color that not on-trend how i could find decor that works great? Yes, a daybed with trundle would have been good, as well! But keeping the existing bed/mattress saved us $$$ . . . I bet your kitchen is so fun! Would love you to post a photo!!! I’ve always chose my paint color first and never had a problem. I found all the right fabrics, rugs, furniture, accessories… and it was fun! All the colors wound up blending beautifully within each space and from room to room. Bucks the trend but very good advice.